This week we started our sessions exploring the woods to find woodland treasures. This involved counting and describing the objects as well as naming some of the familiar items in the wood. The children are developing their gross motor skills, balance and co-ordination as they are getting better at navigating through the woodland environment, using ‘big, stompy feet’ to step over the brambles and logs. It amazes me how our regular Forest Schoolers have become so knowledgeable about the different leaves, moss and lichen in their environment, which really shows how connected they have become with Oxhey Woods since attending. It was great to meet our new families at our Parent and Toddler groups this week. We hope that they will enjoy getting to know each other over the weeks and we will enjoy watching the children get more confident in the environment. This week our fantastic Parent and Toddler group were introduced to the Bow Saw. Whenever we use a new tool, we introduce it with a tool talk. This helps keep us safe when using the tool as we learn how to hold it and pass it, how to hold it, naming the different parts of the tool and what position to be in when we use it. The bow saw is a lot of fun to use. When we are using it, we wear a glove on the working hand holding the wood to keep it steady and pull the saw, working in a team to cut our wood. 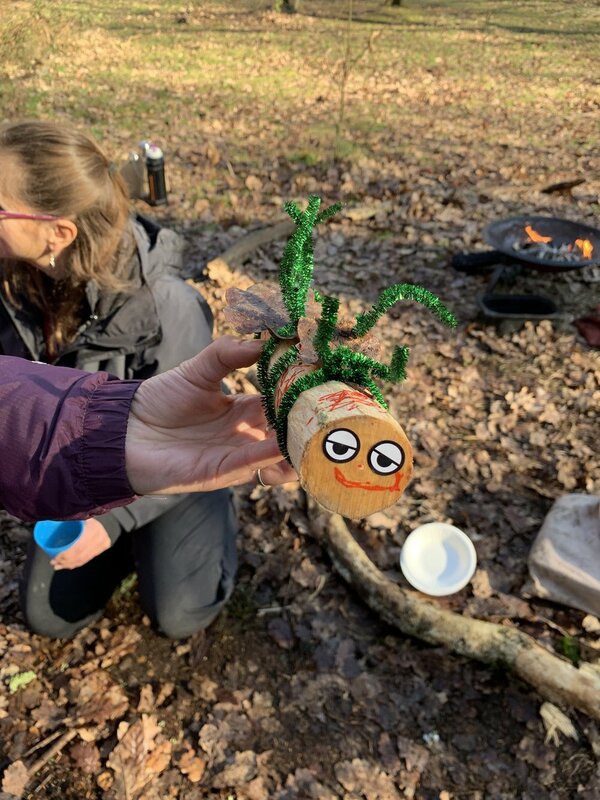 We were so impressed with the variety of creatures that the children created after whittling the outside layer of bark off their log ranging from disco pandas to crazy dragons. What great imaginations! We finished the session with some delicious popcorn cooked on the fire. We all loved watching it pop and fill up our popcorn net! It is National Story Telling week and we enjoyed sharing the story of the Three Little Pigs with our Parent and Toddler groups. It is great to come back to familiar stories often, particularly ones that have repetition, such as the Three Little Pigs. The children were great at using the stones to tell the story and joined in. You could see this sparked a-lot of their imaginations during play today, blowing the houses down and putting the pigs (and the wolf!) inside the houses. Construction takes a lot of problem solving: working out how to balance things and using a steady hand so that the structure doesn't fall over. When building the stick house, the children sorted and compared the sticks lengths using the language of sizes. A steady hand was needed to build and handle the flour bricks in order to create walls. A lot of patience was needed to wait for our bread to toast on the fire! A skill lots of our little ones find very challenging, but hopefully they enjoyed the end result! This weekend is the Big Garden Birdwatch and to get ourselves ready, we made some bird feeders today using cheerios and pipe cleaners. This is a lovely activity to develop fine motor skills and the children did so well, concentrating and taking their time. I hope they attract some birds to your garden in time for the Big Garden Birdwatch. Some of the Parent and Toddler group thought they would have more look spotting some birds from inside a tent hide. We had a go with Sammy the Snake again to make our ridge line for our shelter. It's lots of fun putting up a den and hammering in the pegs. This week our Parent and Toddler group had a go at using 'Sammy the Snake' to tie a timber hitch knot between two trees to create a ridge line and a tarp to create a theatre. Sammy went round the tree, over and under the mountain, then in and out three times. After hunting for our character puppets in the woods, we worked together to tell the story of Little Red Riding Hood from behind the tarp theatre, using silly voices to pretend to be the different characters. It was lovely to see the children getting involved and using their imaginations. During our sessions we support the children in becoming familiar with the different flora and fauna around them. Today we looked at the shape of the Oak leaf: bumpy bumpy bumpy. This is one of the main trees in our clearing in Oxhey Woods. The children thought about the texture of the leaves and crunched them up. We used the leaves to decorate wolf masks that the children made and learnt how to thread and tie knots to secure the mask. This is a great skills to get to grips with and there are lots of opportunities in Forest School. We even used a knot in our newspaper when building and lighting our fire ready to cook some delicious marshmallows: Go over and under and through. It was great to welcome back our Forever Green Forest Schoolers this week and welcome some new families. Exploring the forest is a lot of fun. Our Forest Schoolers were on the hunt for some clues to determine what our story was today. They found story stones hidden by the roots of the trees in the woods and worked together to collect them all. Gathering under the shelter of our tarp, we told the story of Goldilocks and the Three Bears. Stories are a great launchpad for imagination, creativity and exploration and we love sharing and acting them out with the children. After listening to the story, the children got to work looking for the right sort of stick to make a Goldilocks or a bear stick man. We provide different materials to join and hope to encourage development in fine motor skills as they twist and turn the pipe cleaners and string to secure items together. After all that hardwork, it was time to get cooking. The children helped build the fire, thinking about how to keep safe and what we would need. One dragon sneeze later, the fire was going, ready to cook some delicious porridge made in our Dutch oven. Everyone had a taste of the delicious honey topped porridge and just like the bears (and Goldilocks), the children gobbled it all up. We still have places available in our Monday and Friday group, so if you are looking to get out and about and have friends who would like to join the rest of the half term, we would love you to join us! We have had a fantastic half term, moving from Autumn into Winter with our Parent and Toddler groups. 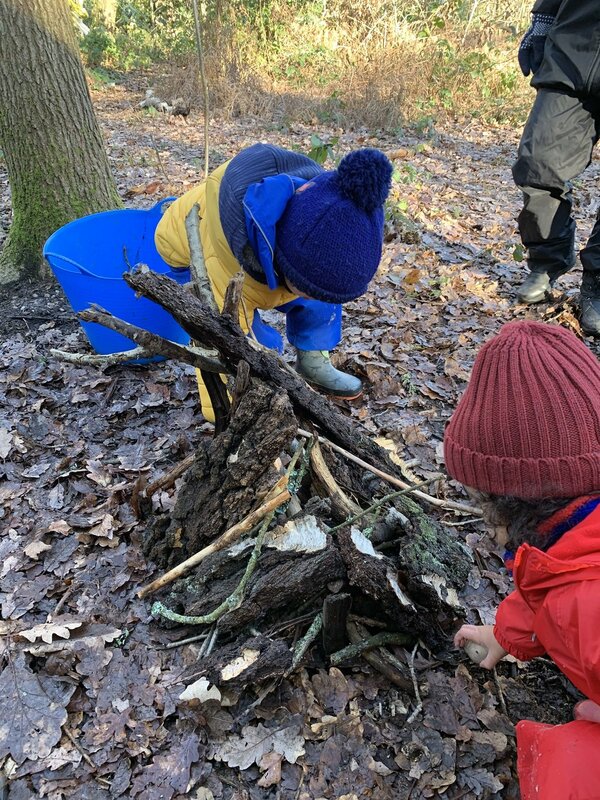 We work on a lot of different skills during our Forest School sessions, but it really is so great to see how the children have become more confident in themselves and with each other over the weeks together. There are some very loud voices coming from behind the trees shouting "1, 2, 3, I'm here!" and its lovely to see the children high fiving each other when they have been found. The woods have changed over the last few weeks, but the children are confidently navigating their way over the branches and brambles as they explore. There may not be any snow yet, but this week the children worked together to create a fantastic snowman. The children thought about the different natural materials available around them and used these to create a magical snowman. They discussed the textures and placed them carefully to make the picture together. Well done! It has been quite a rainy week, but it didn’t stop our Parent and Toddlers enjoying Forest School. It was great to see them enjoying puddle jumping and making the most of the weather. We even managed to collect our water for the fire from the tarp! What a great idea. The children started the session this week by going on a scavenger hunt around the site to collect tiny treasures. A tiny treasure box is a lovely thing to keep adding too while you are out adventuring. We found some lichen, moss, tiny stones, leaves and twigs. 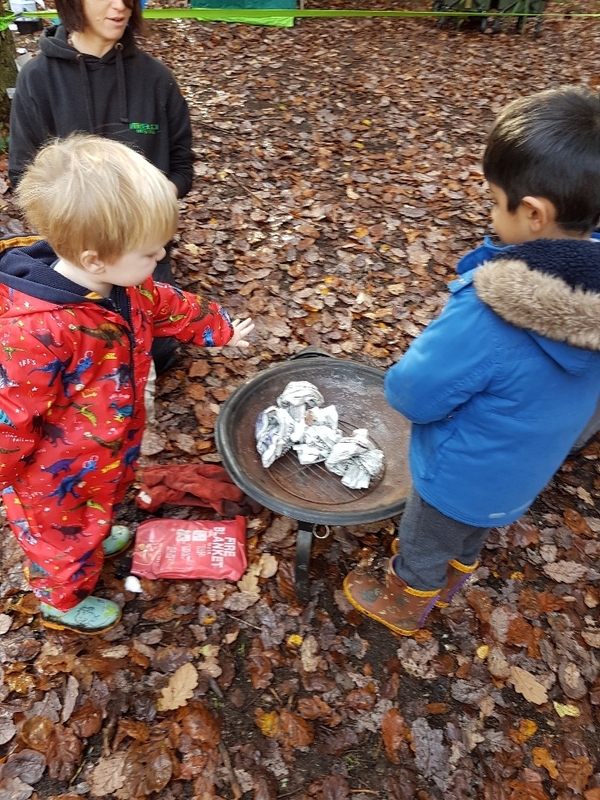 We love scavenger hunts at Forest School as it provides an opportunity to develop language through discussing the textures and colours. With Christmas just around the corner, the children had a go at creating some wood cookie snowmen using the drills. It takes a great deal of concentration and perseverance to keep winding that drill to create a hole in the wood, but the children didn't give up and got there in the end. We hope their decorations will look nice on their Christmas trees. This week we had a go at cooking apples slices dipped in sugar and cinnamon on the fire. The children showed a lot of patience waiting for their apples to cook and they were worth the wait. It’s great to try new things. 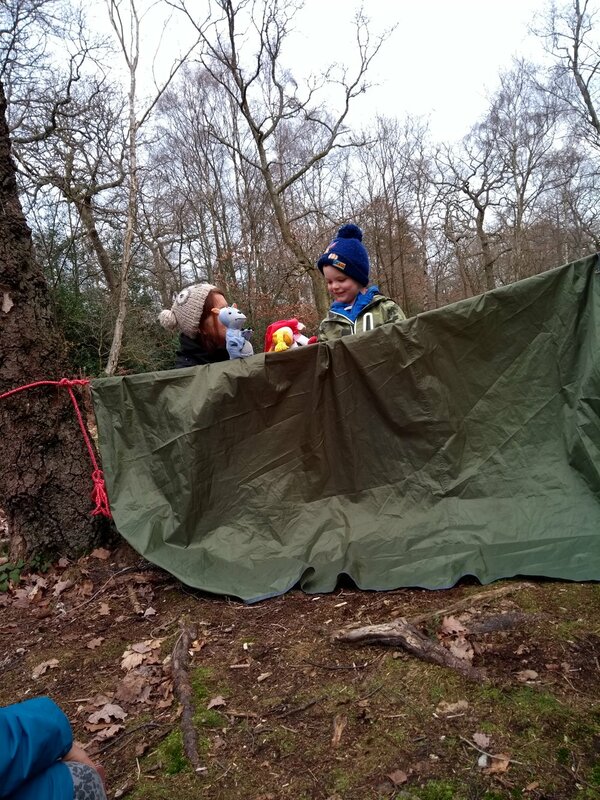 We had great fun in the woods this week with our Parent and Toddler group. With the change in seasons approaching we started thinking about our feathery friends in the trees: the birds! A great thing about being out and about each week is providing the children the opportunity to observe changes in their environment. When children are young, we talk about the Winter months being December, January and February, even though the Winter Solstice (the shortest day of the year) doesn't occur until 21st December. When we were exploring, we thought about what has happened to the variety and number of minibeasts out and about, how it gets darker earlier in the evenings and lighter later in the mornings and that many animals hibernate or migrate. To feed the birds in our forest, the children carefully spread vegetable fat onto their cones . They were very gentle and managed to cover their cones using the birdseed. This will provide lots of energy for the birds that come to visit. We also were developing our co-ordination by hammering in stick pegs to secure the corners of our dens, before hiding in them to spot the birds. Well done to those that had a go at putting up the shelter using Sammy the Snake and a timber hitch knot. We had to remember to stay quiet and hidden in the dens that we made and were lucky enough to spot some visiting birds using our binoculars. It has been very cold this week, but our Parent and Toddler group have been all wrapped up warm and ready for adventures outside. Each week the children are becoming more confident at being safe around the fire. They are understanding what is needed to make fire and this week they got the chance to create their own sparks using the fire steel. It takes a lot of concentration, patience and resilience to create sparks and then use the sparks to light the cotton wool (even for adults). Well done! The children enjoyed cooking something new this week. They used ice-cream cones and filled them with delicious treats including chocolate chips, marshmallows and banana, before putting them on the fire to melt and get all gooey! This was another opportunity to talk to the children about the changes that are happening to the food as it cooks. We enjoyed watching how runny the chocolate got. This week our Parent and Toddler group have been exploring the Foggy Foggy Forest after reading the book by Nick Sharratt. They did a great job solving the puzzles and finding all the characters in the Foggy Foggy Forest. The children are definitely getting more confident at walking longer distances through the woods, taking care where they are walking and navigating the mud and brambles. Walking on uneven and irregular surfaces is great for children's core stability and strength. Some children enjoyed creating a debris den together. They had a lot of fun and the children took a great sense of pride and achievement in their creation. It also provides a great opportunity for problem solving through comparing and ordering the sizes of sticks and working out where they can be balanced, promoting lots of comparative language. Our session finished with the children cooking some delicious brioche. The children thought about what was needed to make the fire, how to stay safe by using the correct position and what equipment we needed to have to keep ourselves safe around the fire. We discussed the colour and texture of the brioche before and after it was cooked. Delicious!